A beautifully designed, tough, and cheerful roguelike that rewards perseverance with a singular feeling of finesse. What Is It? Rhythm-based roguelike that demands coordination and perseverance. 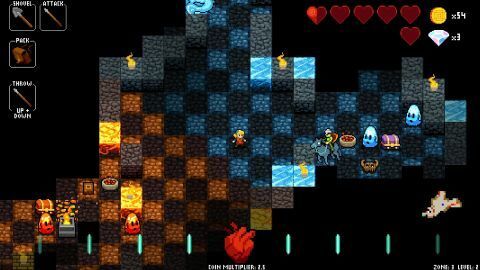 Unlike many games that carry the label, Crypt of the Necrodancer is a roguelike that is actually quite a bit like Rogue. You control a lone hero in a grid-based dungeon, pushing back the fog of war square by square as you explore each randomly-generated set of chambers. As you journey deeper you gather gear, spells and consumables to help you survive encounters with monsters who behave according to predictable routines. If you die, you start over from the beginning. In a traditional roguelike, your greatest asset is the time you're afforded to think, assess, plan. Crypt of the Necrodancer's defining flourish is that it reduces your thinking time to the space between two beats on the soundtrack. Move to the rhythm and you build up a multiplier, turning the ground into an illuminated dancefloor and boosting the gold you earn from every kill. In order to be able to afford the best gear, then, you should always be moving. Move thoughtlessly, however, and you'll die. The result is a game where you are always taking action but only sporadically acting well. What was once a meditative, considered experience becomes a rush of on-the-fly strategy and occasional finesse—becomes, in short, a dance. Every enemy introduces a new pattern to learn, from oozes that bounce back and forth along set routes to shield-bearing skeletons that need to be dodged from the front and disarmed from the side. Initially, you'll scrape through these encounters by relying on your reactions. In order to really progress, however, you need to memorise each pattern and then practice enough for the right counters to become second nature. This process is further complicated by your gear. Different weapons have different attack patterns and your options are expanded laterally by magic rings, spells, and the ability to tunnel through walls. The optimal approach to a given room, then, is something you'll need to figure out fresh every time you play. It's here that Necrodancer's skill ceiling rockets upwards, and where the game becomes essential for players who love mastering complex combat systems. In most rhythm games, the pattern you need to follow is right there on the screen. Here, the pattern is something you learn to perceive. One of the most gratifying feelings a roguelike can convey is the sense that your understanding has tangibly improved despite repeated failure. Crypt of the Necrodancer nails that feeling. You start out clumsy and improvisational and many hours later you come out graceful and confident. This is a point of powerful confluence between the roguelike and the rhythm game, and Necrodancer's devs make the most of it. The core game follows the Spelunky model of four main worlds subdivided into individual levels, although Necrodancer inserts clever boss battles between each one. To make progress more palatable for those still learning, you can take on each world one by one if you'd prefer not to be reset to the beginning every time. In this mode, you're also able to rescue NPCs that sell permanent upgrades. This provides you with a way to gradually make a tough section accessible, evening out the formidable difficulty curve and ensuring that you'll (eventually) see the ending. You also unlock new characters as you go, and these fundamentally change what the game is about. Bard, for example, doesn't need to move to the beat at all. Dove can't attack, but unlike other characters doesn't need to defeat mini-bosses to open up exits. Eli can't use regular weapons but can plant and kick infinite bombs, turning Necrodancer into Bomberman with a beat. Combine them with local co-op, Steam Workshop mod support, daily challenges and extreme difficulty options to consider and you have a simple game with a vast amount of long-term potential. It's full of lovely little touches, from the way that the shopkeeper sings along to the soundtrack (provided you're not using your own music, which is also an option) to the way the simple animations for each creature sync up with the rhythm. The music's great too, as you'd expect—playful, punchy and varied. Crypt of the Necrodancer strikes the balance between charm, readability and difficulty that is so important for a game of this type, and it does so off the back of a set of brilliantly-executed new ideas. It's not just a good rhythm-action game and a good roguelike: saying so suggests that the two might be divisible in some way. In this case, they're not.